After more than two decades of bringing audiences to their feet, the band LIQUID PLEASURE, has become a multi-cultural icon. Even from the beginning and through the present, LIQUID PLEASURE has never desired to follow the dream path of most bands. That is, being a major recording entity. Sometimes when they are traveling on the road, the guys get in a nostalgic mood, remembering the times past. “When we were still playing the college circuit heavily, with groups like Hootie and The Blowfish and REM,. The Spinners were even scheduled to warm up for us once”, said veteran member, Melvin Farrington. Although, in 1981, when they did record an album, the band immediately focused back on what had been their mainstay from the beginning, the dance and show circuit. This band of guys who have been like brothers, love being in touch with people like them, who love a variety of good music, and appreciate hearing it performed live, by a great dance and show band. In the early years the band was paired with greats like, Chuck Berry, Eddie Floyd and Ben E. King and later, Whitney Houston, The Four Tops, TheTempations and Aretha Franklin. Definitively, LIQUID PLEASURE has always been a hot ticket! I doubt if they realized that they were growing up with people who would remain loyal fans for years to come. The fans that grew up with The Temptations, The Four Tops, Aretha Franklin and LIQUID PLEASURE, are now in charge of corporate America. When they want to be reminded of better times, they party with LIQUID PLEASURE. Kenny’s wisecracks and comedy along with mesmerizing choreography are synchronized with the band’s great blend of music. The reward for their patience has been great! LIQUID PLEASURE has set a new standard. With no album high on the charts to boost them, LIQUID PLEASURE is a marketing phenomenon. By word of mouth only, they are the most accomplished band in their circuit. They performed for former President Bill Clinton’s Inaugural Ball and that of current North Carolina Governor, Mike Easley. The RAVENS Football team, had a Super Bowl blast in 2000 with LIQUID PLEASURE at the helm! They are the regular choice for entertainment at the PANTHER’s house. I’ll bet the HORNETS basketball team even credit LIQUID PLEASURE with making their day in the 2000 and 2001 NBA finals. Without a doubt, HURRICANES 2001 New Year’s Eve party, was one to remember! Sports, Corporate, Private, and just about any other venue are no challenge for LIQUID PLEASURE. Letters pour in all the time from satisfied clients. Corporations like Budweiser, Pfizer Pharmaceutical, American Express, SAS Corporation and Barron’s Securities Corporation, have signed on the dotted line to insure that the entertainment for their function was a guaranteed success. 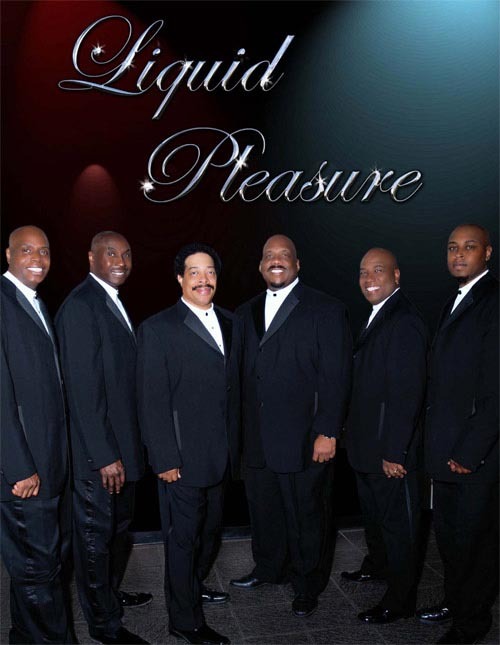 Announcements of LIQUID PLEASURE’s scheduled appearance at fundraisers for The American Heart Association, Make A Wish Foundation and The Special Olympics added to their success. LIQUID PLEASURE, Bringing Fun and Excitement to People Who Want to Have a Great Time! Liquid Pleasure was AMAZING! Staff and members all loved them! They were very personal and very complimentary of the Club. They killed it for us. Thank you very much again Steve! Clarence Carter – Dr. C.C. Naughty By Nature – Down With O.P.P.